If the quality of a movie could be gauged by how happy the cast is filming it, then The Tailors (Sanguiwon) is a sure fire win based on the bursting with joy cast at the movie press conference this week. I’m not exaggerating by describing the cast at the press conference as so giddy and glowing one would think they were all getting married or something equally celebratory. The movie released a full cast poster ahead of its premiere featuring all four leads Han Suk Kyu, Go Soo, Park Shin Hye, and Yoo Yeon Seok, supplementing the gorgeous individual character posters released a few weeks ago. I’m still iffy about the story about two rival royal tailors duking it out for supremacy at court to dress the King and Queen but it’s no joke how beautiful the movie looks based on posters and previews alone. The colors and textures on the royal clothing are to-die-for. 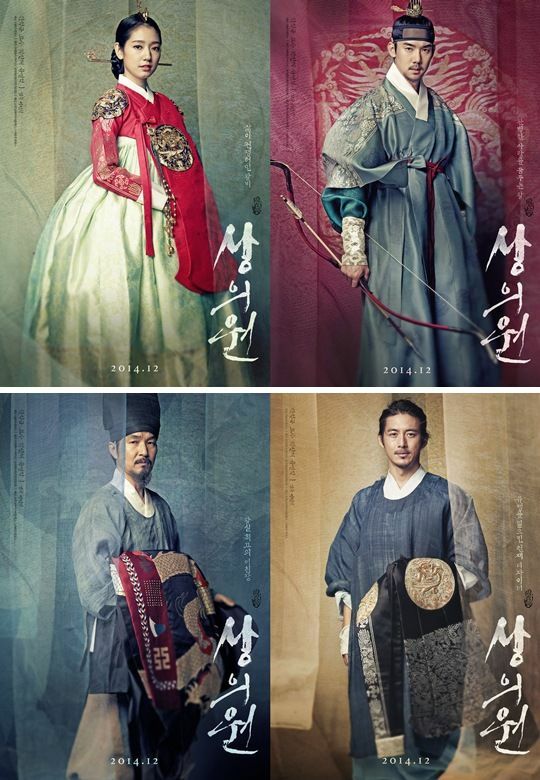 I also love how all four leads perfectly express each character in the poster above, from cheeky Go Soo as the upstart tailor, serious Han Suk Kyu as the establish old school veteran, melancholy Park Shin Hye as the Queen, and authoritative Yoo Yeon Seok as the King. I love that dress Park Shin Hye is wearing. But I really don’t get that Korean obsession with platform heels, it cheapens the whole look. I loveee Park Shin Hye’s dress… She looks really classy without revealing too much and she doesn’t look grandmotherly either! I like the dress, but I hate it on her. Park Shin Hye is a young gorgeous woman, but her styling is so matronly. One can be demure yet alluring, but in her case, she dresses way too old for her age. Aww, the younger tailor seemed to tan just for the role which is sad because he looks very attractive with it. Anyway, I can’t wait for this to come out! I’m enjoying PSH in Pinocchio. I’m a bit surprised that her and LJS are the main reason I’m still watching. I love Han Seok Kyu and his ahjussi style. He’s so great and has one of the loveliest smiles ever. Wow. You weren’t kidding when you said the cast is glowing. 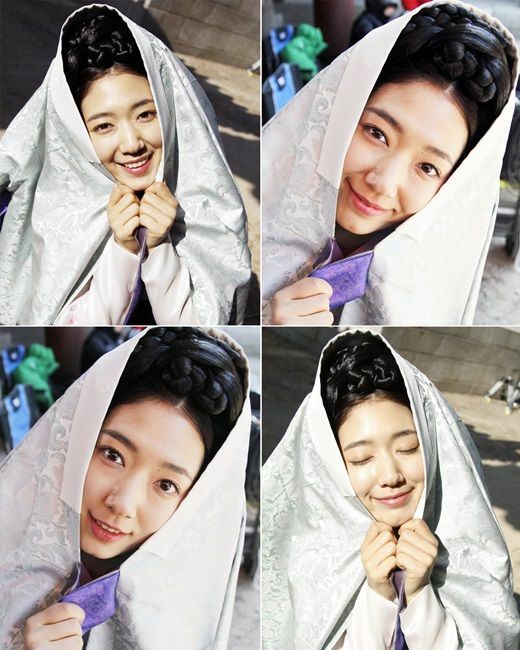 Even Park Shin-hye, who is currently doing a drama, looks rested and enjoying herself. love the whole cast. For some reason, I could not take my eyes off her, in Pinocchio as well. Could she be in love that make her glow? Is it just me or does Go Soo look a lot like Nickhun over here? PSH is as beautiful as always though! I actually love her outfit and those gorgeous shoes she’s wearing with them. For once , i love what PSH is wearing . She looks gorgeous. 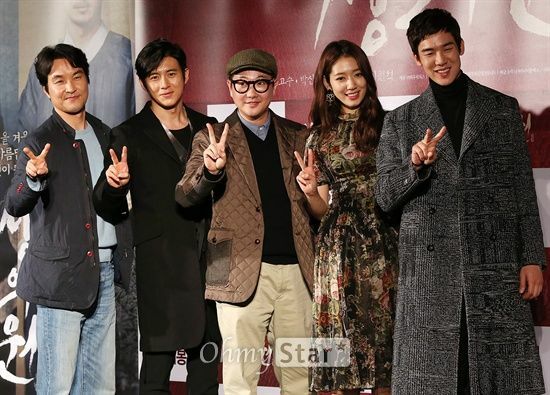 how old is Go Soo ? 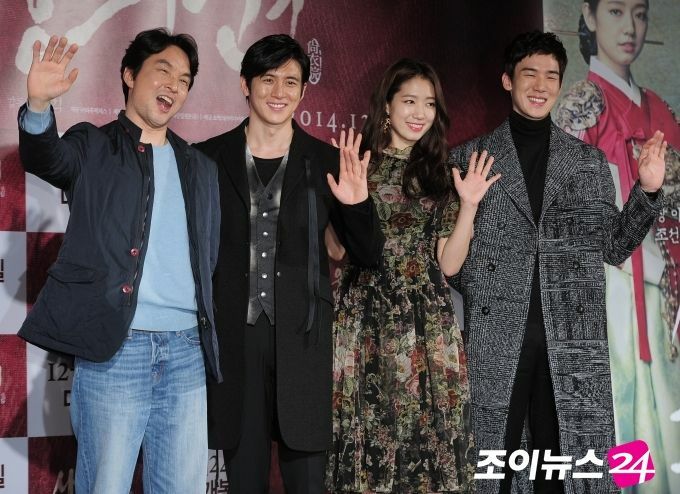 The fabrics of Park Shin Hye’s dress and Yoo Yeon Seok’s coat look like old curtain and old couch.